Inner Line Permit or ILP is a travel document that is required by Indians to visit Nagaland. This document is mandatory for all Indian citizens unless they are a domicile of Nagaland. This can be procured from Deputy Resident Commissioner’s office in New Delhi, Kolkata, Guwahati, Shillong or Dimapur. Dimapur is the only city in Nagaland which people can visit without the permit. While travelling from Dimapur to Kohima or Hornbill festival or to other deeper regions of the state, one needs to show the permit at the check post as you exit the city. The procedure to obtain ILP for Nagaland is a simple process at Dimapur. Go to Deputy Commissioner’s office. The office opens by 9:45- 10 AM during weekdays. Buy the ILP form by paying Rs.10. Fill the form and submit it along with a photocopy of any of your photo ID (Adhaar card, Voter’s ID) and two passport size photographs. Pay Rs.160 along with the form for the permit. ILP for each visitor has to be applied individually. Collect the ILP from the same counter after 1.5 or 2 hours. Make sure to have a couple of copies of the ILP when you exit Dimapur. One can also apply for the ILP online. 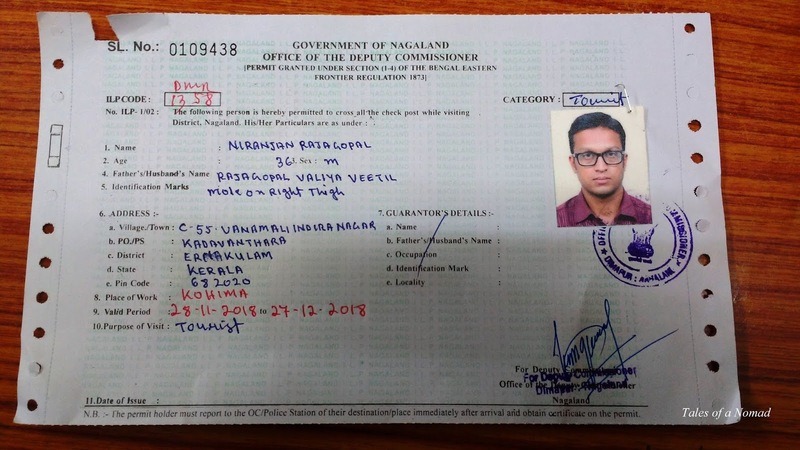 Foreign nationals do not require the permit, but they need to register themselves at the nearest Foreigners Registration Office at the earliest upon entering Nagaland. However, citizens of China, Pakistan and Bangladesh require a Protected Area Permit (PAP). Dimapur was 99% non nagas before 1963 State hood or present still 50% non Nagas.. What about them? ILP for ppl whose forefathers lived here..? This information is for tourists from other parts of India who would like to visit Nagaland. For residents of Nagaland, I don't think they require any ILP. Anyhow, please check with Deputy Commissioner's office regarding the same. Had just read the post of kohima, got this. Sorry, am not that good at commenting, but yes read most of your write ups. Thanks for this one. Thank you for dropping by, Saumiya. Glad to hear that.